Telenor Pakistan presented a cheque of Rs. 2 million to Qamar uz Zaman Kaira, Federal Minister for Information and Broadcasting and then Governor of Gilgit Baltistan to augment the Government’s efforts to help those affected by the land-sliding in Attabad. 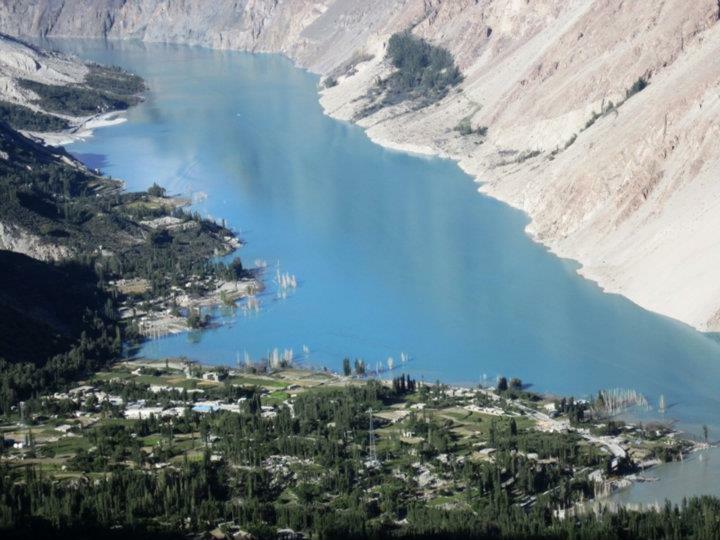 Telenor also partnered with Radio Pakistan to provide emergency communications to the people of Hunza valley and surrounding areas by establishing an FM-93 radio station at Baltit Fort Hunza Karim Abad. The support included mobile handsets, pre-paid voice and data connections, air time and EDGE sticks for live reporting. 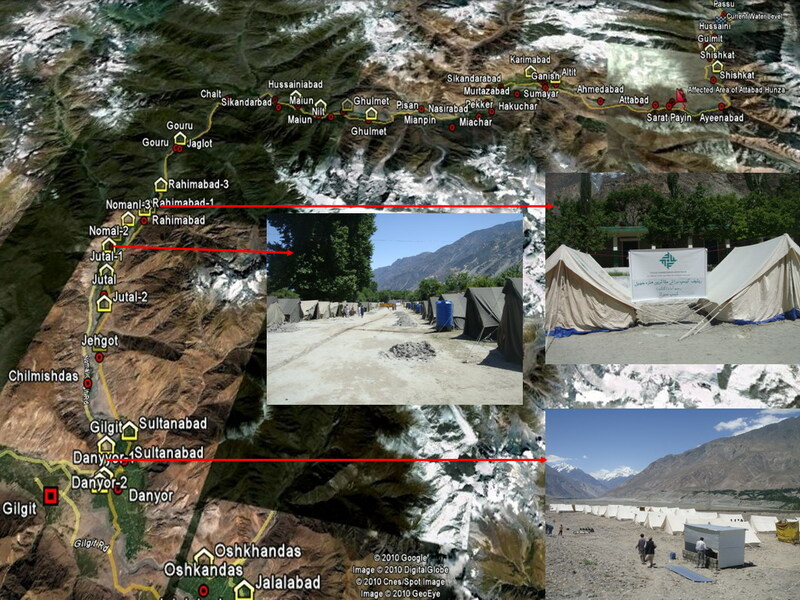 USB EDGE sticks with a data connection to aid data gathering and electronic communication from the Landslide affected areas in Hunza. One of Telenor Pakistan employees (Muhammad Omer Sheikh) has been assisting the efforts as a volunteer and had sought on-ground data from sources in the region which could be made widely available. 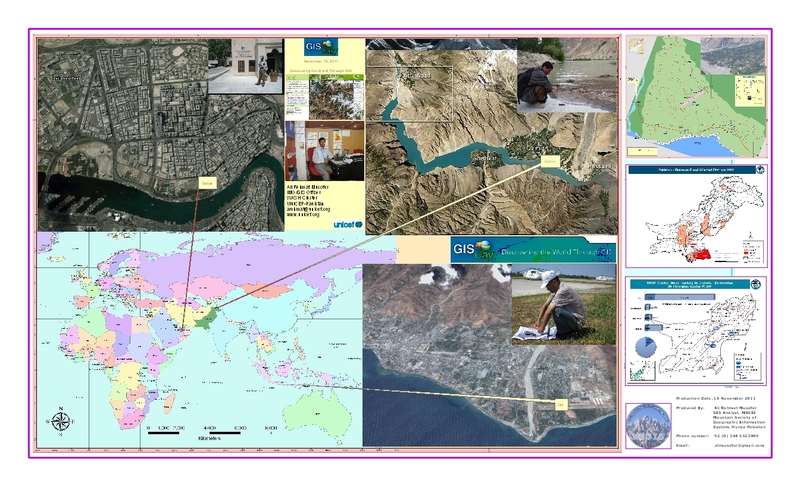 Ali Musofer, a local GIS expert, whose village Hussaini, has already been submerged by the lake waters offered to assist with information gathering but complained of trouble in sharing the information gathered on ground with organizations and others around the country due to poor internet connectivity in the region. The work and information shared by Mr. Ali has been made available by a website managed by our employee Omer and another volunteer and can be visited at click here. 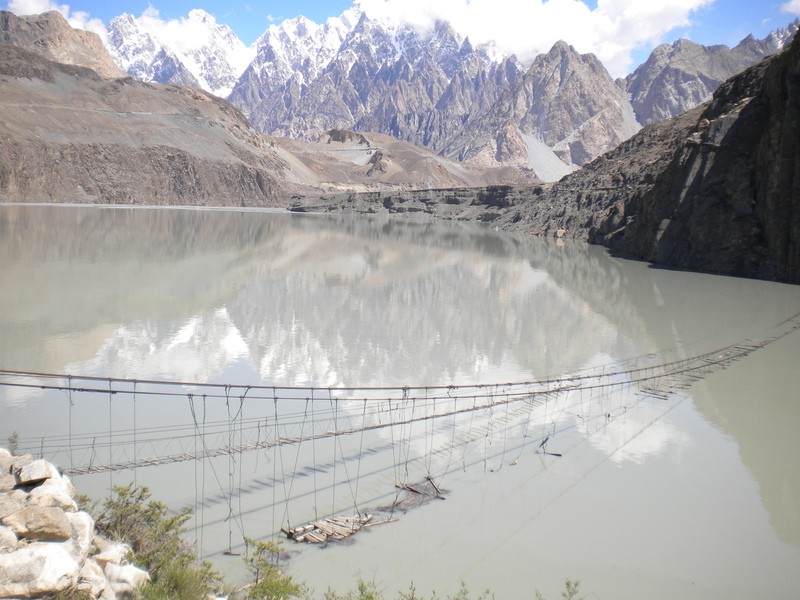 Hussaini suspension bridge almost submerged in water and the foundation also eroded, the only source of communication to zarabad village located at the eastern bank of Khnzhrav river, 635 feet long suspesntion bridge was constructed in 1960s on the recommendation of president Ayob Khan during the Mir of Hunza. around 25 years of the duration of Ghanzafar ali Khan, 10 years of PPP goverment, no one consider to contrct bridge to zarabad vilage, at last the suspenstion bridge also submerged in water due to NDMA and Government man-made disaster. 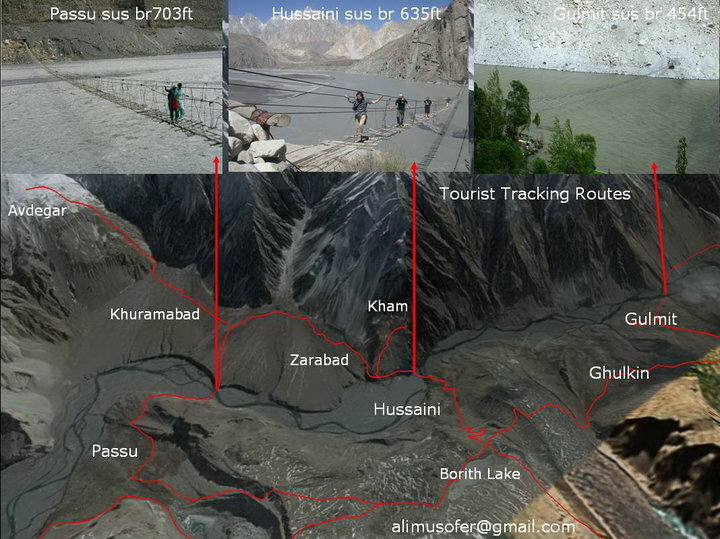 there is possibality of collapased in few days, the people of hussaini not cultivated thier land in zarabad due to this situation, most of the people land are accross the river in Zarabad vilage, Gulmit, Hussaini and Passu suspension bridges were the post attractive tourist spot of Gojal valley, Gulmit suspension bridge already collapsed two week before and passu also at risk. Landslide dams. Lessons we need to learn. What should a local government do when a landslide blocks a river, forming a dam, and the water level in the newly-created lake begins to rise, threatening to flood the downstream areas? What emergency measures need to be implemented? The first that comes to mind is to evacuate the people who live downstream from the dam. The next step to take would be to keep the water level in the lake as low as possible by pumping the water out of the lake. This sounds good too,　but is it enough? The answer is – we don’t know, because there are no guidelines as to the best measures to take. The recent occurring landslide-dams in China show how difficult it can be to manage the above emergency operations in practice. Let’s only briefly look at a landslide dam that was formed in Beichuan County after the Sichuan earthquake, as it has already been covered by media ( “The International Herald Tribune”, BBC News, and NASA reports). 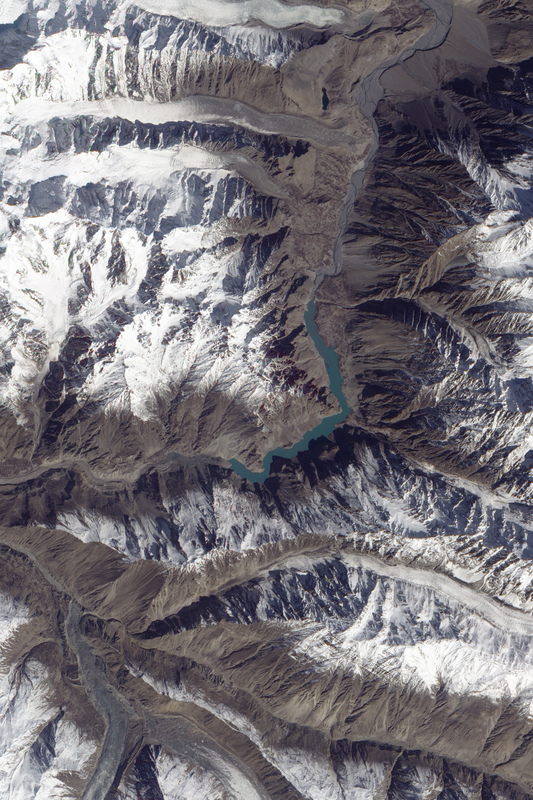 – The Tangjiashan lake began to form on May 12, 2008, when a magnitude 7.9 earthquake triggered a massive landslide that blocked the flow of the Jianjiang River. – On May 24, 2008 the water level rose by 2 metres in a single day, reaching a depth of 23 metres, just 29 metres below the barrier level. – For weeks, the dam of rocks and mud holding back the rising waters of Tangjiashan threatened to burst and flood communities farther downstream that were home to about 1.3 million people. 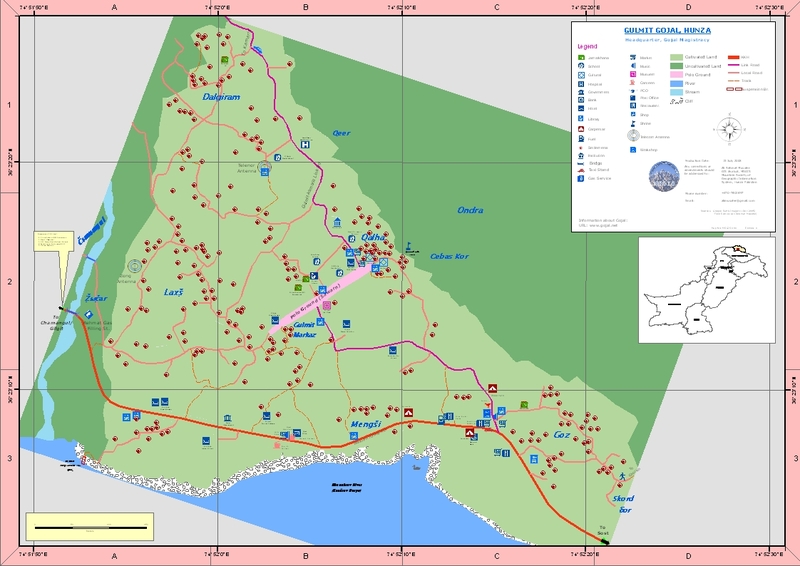 – The government evacuated 250,000 people to higher ground. – In late May, more than 600 soldiers and police officers dug a sluice about 400 meters long to try to drain Tangjiashan. – Water began flowing down the channel on June 7, 2008, flooding the low-lying areas in Beichuan. The gushing water dislodged and wrecked homes, cars and corpses (“The International Herald Tribune”). A couple of questions arise after reading this, such as “Did the local government manage the situation in the best way?” and “Did they have enough knowledge and experience to avoid common mistakes?” At this point we don’t know as the details of the operation have not been made open to public yet. I believe they did everything they could at that time. However, it has become obvious that such information needs to be shared so that local authorities would be prepared to undertake the measures necessary to save people and minimize the economic loss. Unfortunately, only a few reports that describe the emergency actions during a landslide-dam crisis can be found in the literature. For this reason, I would like to share some information that I have obtained through my research. Conducting a field survey of several landslides triggered by the 2004 Mid-Niigata Prefecture Earthquake, I was a witness to how emergency measures were implemented at two landslide-dam sites. Details to follow. 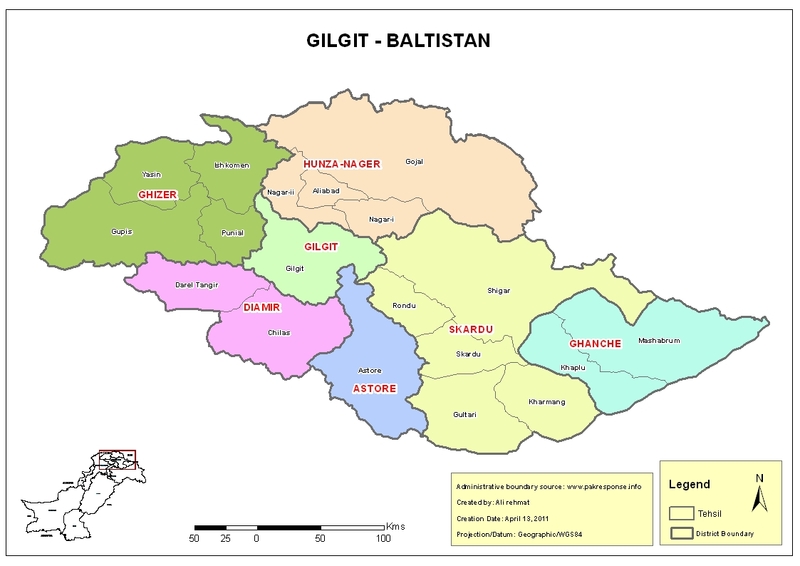 4th of January 2010, was a dreadful day for inhabitants of Hunza-Nagar district in Gilgit-Baltistan, especially the residents of Atta Abad and Aina Abad. In result of long lasting cracks in mountains due to earthquake in late 2009, a massive landslide hit the area by burying the both villages, killing more than 20 people and several of them injured. Hundreds of the residents became displaced and homeless while thousands of others are on risk in aftermath of this catastrophe. 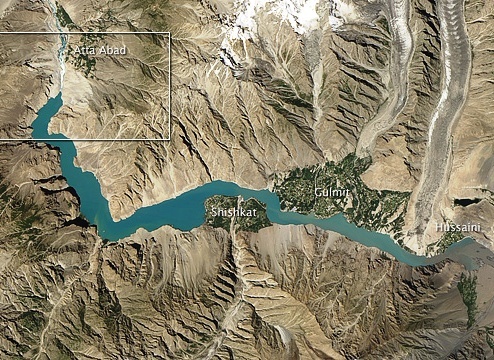 In second worse outcome, the massive debris of mountain rocks filled the space between and blocked water flow of River Hunza, forming a lake which then also submerged the 22Kms [22nd May 2010] long road section of Karakoram Highway (N-35), isolating the main doorway to Central Asia. The water rise wasn’t very quick as incident happened in cold month of January and surrounded glaciers have been calm by holding on to snow. Work initiated for clearing up the debris in late January meanwhile occasionally snowfall and landslide continues which obstruct the work badly many times, even injured the work force seriously with couple of sad fatal accidents. 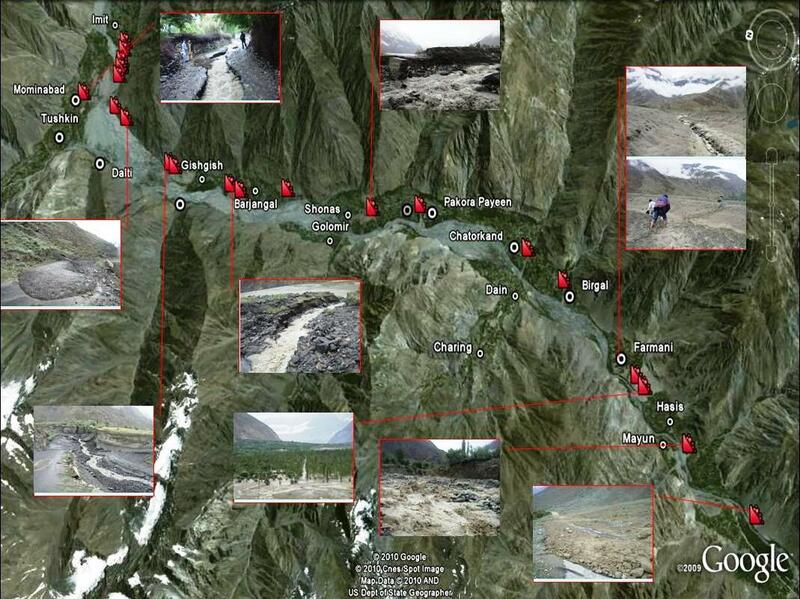 With summer approaching quickly, things started getting complicated as glacier started melting quickly and water inflow increased rapidly extending the lake to 18Kms [22nd May 2010] while there had not been any sufficient water seepage until mid March. This situation also put more remote villages on risk to sink in both cases whether water retain as lake with continuous increasing water inflow or burst in form of heavy flood. One of our distinguished and most active map makers in Pakistan, // Momers posted the situation on Map Maker group on 17th March 2010. Taking the situation seriously, we posted his request for new satellite imagery for area to our different forums asking people vote for the request so it can be handled quickly. Thanks to all those who voted for, quick enough to make this request acceptable within 24 hours by Google. The very next available satellite imagery taken on 16th March 2010 for Natural Hazards records in Earth Observatory division of NASA was made available in special imagery update on 29th April 2010 on request through Google to all their map products for general usage and so for Map Maker to update the maps accordingly. With United Nations SPIDER Space Aid activated for the relief support, Google Map group is hoping for more updates on satellite imageries as they are scheduled and being monitored with time. How its Helping Relief Work? Because of the time gap between imagery update on map products, Google Map Maker community has made KMZ file type and sent to most organizations working on ground including NDMA, SOP, FOCUS etc. To extend relief support for ground forces and individuals, we then also made a relief support webpage. 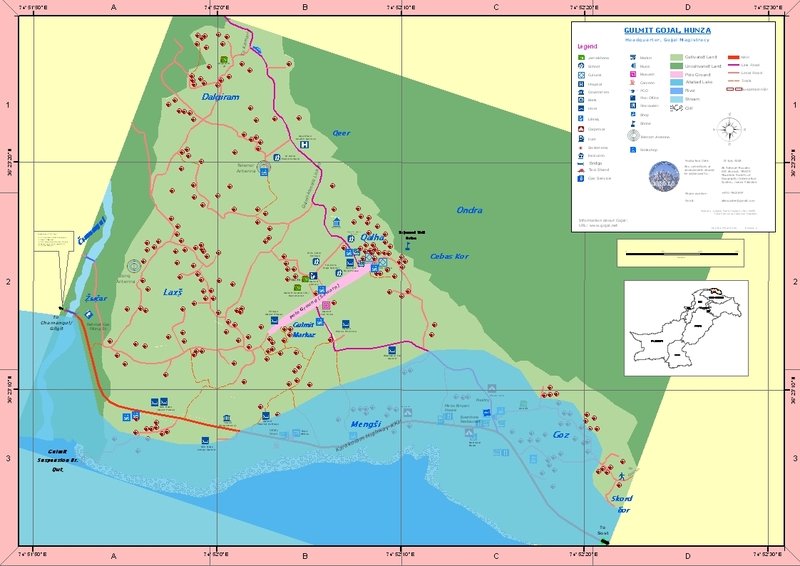 The main purpose of this page is to provide the daily updated map data to all who can use it for any kind of relief efforts on grounds whether they are organizations or individuals. It simply works for everybody. To give a prompt clear idea to visitors, we circled the affected area on map and provided the continuous updated current situation. The base map is being updated by many users at Google Map Maker. Meanwhile the important emergency features such as Relief camps, medical camps or temporary settlements will also be marked directly as an overlay on the map very soon for a quick approach. The webpage is rapidly updated on daily basis to keep users up-to-date about the situation with news, photos and videos from various sources along with new features added as soon as they become available. Unfortunately, since the situation is near to go worse in the area hence the need of time is to provide a support to locals in aftermath of any possible destruction. As we are working in collaboration with Google along with many organizations helping in relief efforts on ground so you can also send us any useful information in format of KML file e.g. Locations for important or temporary emergency features, available facilities at certain places, new temporary pathways which help everybody in transporting local mass, medicine and food. NB. Personal information is not allowed at Google Map Maker as described in its Terms of Service. Moderating the added features with only personal information will only be a waste of time rather than helping us. 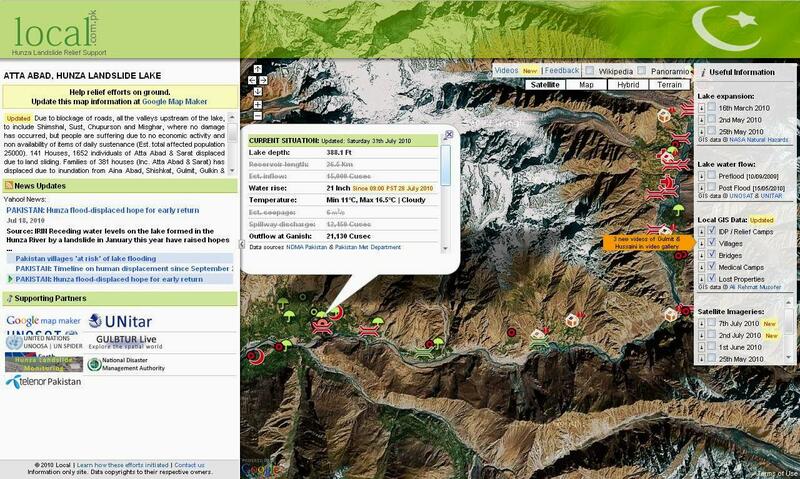 Write is one of the top mapping contributors and Pakistan’s ambassador at Google Map Maker. You have captured very precious movements. i realy injoyed watching and listning the enteries.